Now this is one beer mug that you should seriously consider if you happen to be a pretty strong drinker. After all, when you need your next dose of booze, you are simply unable to wait too much longer, which means that opening up the next bottle is better done by yourself. However, it so happens that in your inebriated state, it is rather difficult to hunt down a bottle opener on the spot – which is why you might want to check out this cool looking Pop n’ Pour Beer Mug. 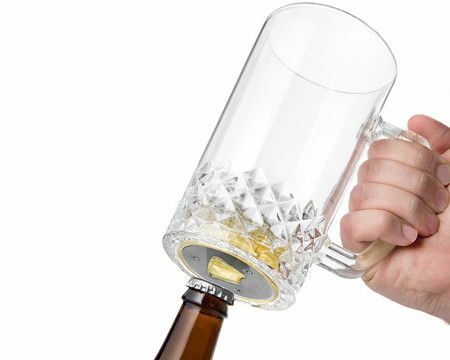 This glass beer mug happens to come with a built-in bottle opener located on the bottom, which is so convenient as this particularly thick glass mug that sports a handsome diamond cut pattern will also feature a stainless steel bottle opener at the bottom, as it holds 24 delicious ounces of beer.